You are here: Home / #DamnitCarl / #DamnItCarl Podcast 4: Can We Stop Stigmatizing Mental Illness? 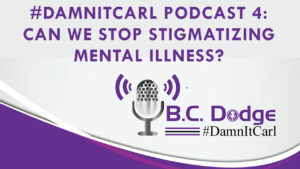 #DamnItCarl Podcast 4: Can We Stop Stigmatizing Mental Illness? On this #DamnItCarl podcast B.C. Dodge asks – When can we stop stigmatizing, and giving dime store psychology advice to those with mental illnesses? According to a 2017 post from the National Institute of Mental Health one in six US adults are living with some kind of mental illness. That is a fairly large number… honestly, if you and five of your friends went to dinner – one of you at that table is living with a mental illness. So why must we make light of someone’s illness? Why must we belittle how someone is feeling? If someone were to have a physical disability, you wouldn’t tell them to just get over not being able to walk. You wouldn’t tell them if you just pray harder your arm will grow back (assuming they lost an arm). So why is it that this how we treat people with a mental disorder? Telling someone with depression or anxiety to “get over it” or just to “pray harder” is not always the answer. However, B.C. does explain that he is not saying do not pray… he is a religious person, and he advocates for daily prayer. But, we need to stop with the stigmatizing people. We need to stop with the ignoring of real issues – and just because you can’t see them, doesn’t mean they are not real issues.